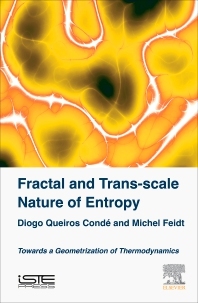 Fractal and Trans-scale Nature of Entropy: Towards a Geometrization of Thermodynamics develops a new vision for entropy in thermodynamics by proposing a new method to geometrize. It investigates how this approach can accommodate a large number of very different physical systems, going from combustion and turbulence towards cosmology. As an example, a simple interpretation of the Hawking entropy in black-hole physics is provided. In the life sciences, entropy appears as the driving element for the organization of systems. This book demonstrates this fact using simple pedagogical tools, thus showing that entropy cannot be interpreted as a basic measure of disorder. Diogo Queiros-Condé is a professor at University of Paris Ouest Nanterre La Défense since 2009. Before he was a research professor at ENSTA ParisTech from 2005 to 2009. He has a PhD in Physic and Science (1995)..